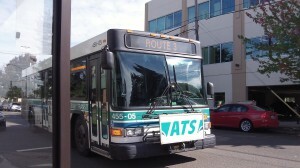 The Route 3 bus arrives, almost on time, at the Albany hospital. The city of Albany offered free rides on its public transit systems this week. It reminded me that as far as I could remember, I had not ridden a city bus in Albany in the years I’ve lived here. Time to remedy that omission. So on Wednesday afternoon I got on the No. 3 bus at Albany General Hospital, rode down to Linn-Benton Community College, back up through downtown, and across the river until I got off at North Albany Village. — The bus drivers (two on this leg, they switched when we stopped at the depot behind the 34th Avenue fire station), were uniformly friendly and patient. A kid got on with a collapsible wire cart, and the driver waited until the kid could collapse it and stow it under the seat. — The passengers seemed to know the drivers and most of them said “Thanks” or “See you” when they got off. — Most of the riders were young, but not all. At the hospital, two older people with disabilities got off. Later, there were women toting bags from Target and Albertsons. One kid was doing homework. Others listened to whatever came out of their earbuds. — The bus was modern, comfortable and clean. It’s a pleasant ride. One passenger said to me as she got off, “Whatever you’re writing, mention …” But it was noisy and I didn’t understand the rest. If she reads this, I hope she emails me what she wanted me to know.